I’m not making any comparisons with the championship Bulls of the 90’s or making any predictions for this Bulls team, which Tuesday beat the New York Knicks 103-90 and now at 61-20 is tied with the San Antonio Spurs for the best record in the NBA. It was an impressive win over the only team the Bulls haven’t defeated this season, though without great meaning as Amar’e Stoudemire didn’t play and playoff matchups set. It perhaps raised some questions about the Bulls and coach Tom Thibodeau’s methods as Ronnie Brewer suffered a sprained thumb retrieving a loose ball in the second quarter and did not return, and Joakim Noah appeared to roll his troublesome right ankle again in the fourth quarter, though Noah said he was “fine” and Thibodeau had him up to return to the game in the last minute before time expired. Perhaps you can second guess Thibodeau, though if he were resting players Brewer would not be resting. And management has been in agreement with Thibodeau that Noah needs to play to regain his timing and cohesion from his long injury layoff. Noah had a more lively effort with 13 points, though just three rebounds as once again because Boozer generally guards the lesser offensive inside player, Noah spent a lot of time chasing Shawne Williams. Noah clearly is annoyed being asked about injuries and pretty much kept his answers succinct, saying repeatedly he was fine. I’m not fully sure he was as it appeared to be quite a twist as he stepped on Williams’ foot. Boozer, playing inside against smaller, non scorers like Ronny Turiaf and then Jared Jeffries, scored 14 points and grabbed a season best 22 rebounds, one short of his career high. And ‘ol reliable Luol Deng quietly played just under 44 minutes—rest is for sissies!—and had 23 points and 10 rebounds. Which is where the Bulls are and what they are doing. There isn’t a team playing better in the NBA now as the Bulls got their eighth straight win. They haven’t lost more than two games in a row all season, and not since before the All-Star break. They have four two game losing streaks all season, and since the All-Star break have two eight game winning streaks and two four game streaks. They’ve won 12 of 13 and 20 of 22. It was like that in the grand old 90’s for the Bulls as those teams never took their foot off the accelerator. They won six of their last seven in 1991, 11 of their last 13 in 1992, 12 of their last 14 in 1996, 14 of 18 in 1997 and 16 of 19 in 1998. Phil Jackson rarely held them back, the point being you establish some sort of dominance, you don’t play out of fear but confidence. You go into the playoffs feeling emboldened and self assured. It’s like the tough kids coming to the playground, like what Tiger Woods used to be, that feeling you projected of invincibility even without playing those guys. The Celtics are resting players basically because it seems they almost need an escape from the pressures of the game. The Lakers are flummoxed and faltering. The Spurs seem to be trying to avoid a Lakers’ matchup, so they even took a pass on going for the best record. They seem like they’re saying they’ll worry if they get there. The Bulls seem to be saying they’re going for it every day. But this is truly a remarkable season, history thrust on everyone without much expectation. It becomes hard to fathom. Though few predicted a Bulls championship in 1991, they were supposed to be on the precipice of something special. After that, once Jordan’s talent meshed with the success, the mystery was only how they’d get there. Not whether they could. Which is not to say this team is guaranteed anything. But they continue to face down everyone and find ways to succeed through Rose’s brilliance, or the reserves’ hustle or overriding defense or just a another tweak and kick in the rear from Thibodeau. It wasn’t a particularly noteworthy start as the Knicks sped up the game, shooting 52.4 percent in the first quarter and leading 27-24. The Bulls made an effort to get Noah back to his effort with Thibodeau giving Noah extra private tutoring the last few days, and Noah hitting the boards for a putback early and getting a driving score. It wasn’t great stuff, but it was better than we’d been seeing. In New York, they come to see a show and to be seen. It’s a dump of an arena with a second grade of celebrity compared to Los Angeles. But the players like the stage of the big city and the back lit effect of the arena in the flood lights with the stands darkened gives something of the look of a Broadway stage. The great ones like to perform in places like that, and you can tell already the fans have come to expect it of Rose. There’s a collective holding of breath now when he gets the ball on a fast break or in the open, the way you’d hear the crowd grow silent in expectation for Jordan or Dominique or Dr. J. Late in the first quarter with the score tied at 20, Rose blocked a Chauncey Billups drive and ran out for a score, a Carl Lewis type blur. Like watching the Masters on TV, you don’t quite get the feel for the course and its undulations, and unless you see Rose in person you don’t realize just how fast he is when he turns on the speed for one of those drives. Knicks players generally don’t get in the way of anything weighing more than 50 pounds, not that they could catch Rose, anyway. You seem to hear the “whoosh” as he goes by. Later in the quarter, after Boozer blocked a Bill Walker shot, Rose took off with Brewer. Brewer doesn’t quite have the lob pass down, but threw one up to Rose on the run. It was a bit short, but Rose grabbed it and wound up slamming the ball hard right handed as the crowd exploded. That’s what they pay for! It wasn’t a particularly sharp defensive effort, especially as Carmelo Anthony got off in the first quarter for 11 of his 21 points, mostly in a two man pick and roll game with Billups. The Knicks kept the lead and moved it up to nine early in the second after Brewer went down with Jeffries fighting for a loose ball. Brewer got a timeout and possession, but came out holding his left thumb. Brewer will be reevaluated Wednesday. “Strained ligaments,” he said. “It’s not broken or anything. I dove on the floor and jammed it and it got pulled back. So it’s stiff right now. I wanted to get it taped and come back, but Fred (Tedeschi) wanted me to sit. I told the coach I wanted to come back in. If it’s still attached I’ll be out there. Thibodeau has been calling plays more for Deng coming out of time outs, and got scores from Deng after both timeouts in the second quarter, though the Knicks went ahead 40-31. Omer Asik had a tough time, hit in the face with no call and then thrown down and getting called for an offensive foul. C.J. Watson, getting more time with Rose since Watson can make plays with the ball as well, led the Bulls with nine in the second quarter. And Rose got the crowd up again with an encore, a two handed tomahawk slam after a long rebound from an Anthony miss. But the Knicks clung to a 55-52 halftime lead with 61 percent shooting in the second quarter. No, not exactly the stuff of a great defense. Thibodeau doesn’t usually make major adjustments at halftime, but he is excellent with a targeted adjustment and an admonishment for better and more compete effort. The Bulls have routinely been a much better second half defensive team based more on a heightened desire. “You’ve got to have a multiple effort mentality against a team like this,” said Thibodeau. Thibodeau also made a bit of a tweak that went a long way. The Bulls generally “show” on screens with good scorers, meaning they send a defender to string the screen out. But Anthony, who has an unusually quick shot, was taking advantage of that by popping back and having enough space to get his shot off without much of a defensive contest. So the Bulls began to go under the screen to give the defender a better chance of getting out on Anthony, and it seemed to work as Anthony was two of nine for six points in the second half and Knicks coach Mike D’Antoni pulled Anthony and Billups as the game got out of reach quickly. It did so with a smothering 26-2 Bulls stampede to open the second half. Keith Bogans hit a pair of threes from the corner on Rose penetration and pass as the defense sunk in, the bench erupting as the second to make it 70-57 was in the air. Rose walked into a long jumper , Deng made pull ups, Rose misdirected a touch pass to Noah, catching the Knicks leaning the wrong way. And then Rose topped it off with a double pump over the shoulder slam dunk on a breakaway. He doesn’t say much, but you can tell he likes to show off in his own way. While all this was going on for the Bulls, the defense was in bank closing, safe lockdown. 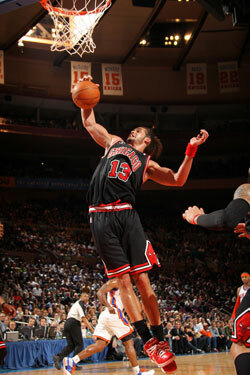 The Knicks don’t go inside much, anyway, the Bulls with a 51-33 rebounding edge and 19-6 on second chance points. It was 48-34 Bulls in the paint, but 44-22 through three quarters when the game still was being contested. The Bulls were flying at shooters, helping one another, forcing the Knicks outside and off balance. No easy shots, the middle closing like a trap on a rat, which they have plenty of experience with in the New York streets, and the Bulls went up 21 before leading 84-73 after three. The Knicks brought in the outside shooting crew, and they did make a run to get it within 91-84 with 8:12 remaining. But Watson handed off for a smooth Rose three. Boozer, who has moved the ball well, drew the defense and found a cutting Taj Gibson for a beautiful score, and the Bulls pulled away again as the Knicks shooting arms tired out again. The arena began to empty quickly with about five minutes left and the Knicks down 15. I was listening to some conversations as Knicks fans left. The Bulls are having that effect on teams and their supporters now. Pretty remarkable. Best to try to keep it up.